Saint Avit is a tiny hamlet located on the Charente / Dordogne borders in South West France. The property is a spacious house, set within a large garden. The house is comfortable, light and full of character. It has a lovely bright living room with French doors and an open fireplace. There are two large bedrooms, one with an ensuite bathroom and French doors, which open on to your own private decking with stunning views of the countryside. There is a separate bathroom with bath, shower and toilet. Additional beds can be added for increased accommodation. Cots, high chairs and plenty of other baby items are available if needed. The kitchen is fully equipped, with dishwasher, washing machine and all of the utensils you will need to enjoy your holiday banquets. There is outside dinning and a BBQ area. The private swimming pool and the terraces are wonderful places for all of the family to relax and enjoy the sun. Plenty of activities are available to keep the family entertained including table tennis, darts and the use of two adult mountain bikes to help you explore the local countryside. I grew up in Cornwall, which was great as I love the ocean. Since 2009 I have worked on a private 30m yacht which cruises around the Med in the summer and has a winter berth in Antibes. I currently live on the boat. My parents decided to move to France back in 2012, they live 30 minutes away from the property I have bought. 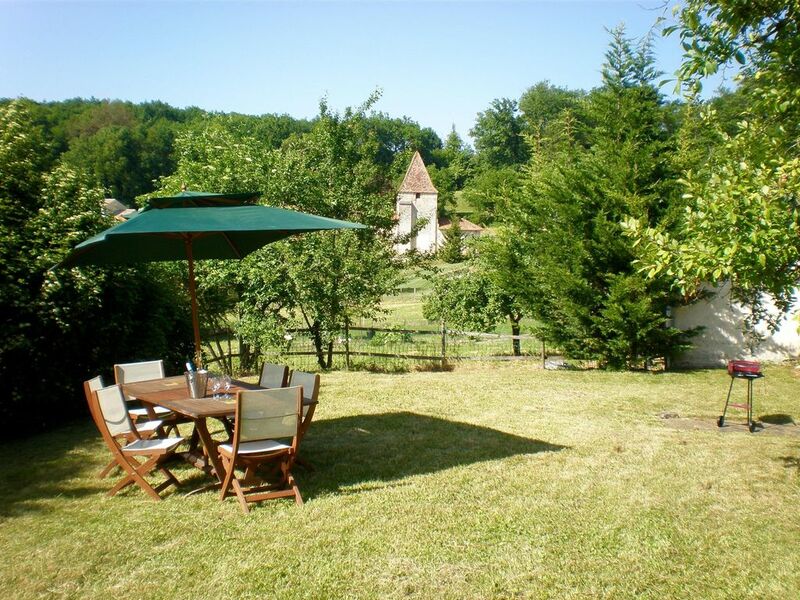 I love escaping from my busy life and running away to the Dordgogne/Charente area so when I found this property is was it was truly love at first sight. I like the countryside and the view from my house is bliss. Its peaceful but there is also so much to do in this region, very diverse. I just love it!! I fell in love with this property for many reasons, firstly the view from the garden is stunning, the location is perfect you are close to everything, all the sights, towns, activities but you have the privacy of the location, house and private garden. the house itself is very spacious every room is large and filled with light. It is my home and I have made it that way so when guests stay here they have the same feeling. In the village there is a 11th Century church so all the houses have character, mine is over 200 years old, I just love the stone work and the open log fire. With perfect outdoor space you can make the most of the property too, outside dining, bbq, table tennis, private pool (5.5m by 3.6m) and lots of games for the children/family to be entertained. Such a gem of a place. Absolutely Perfect. After looking at the photos and description, we decided to book this place. I contacted Sarah who was extremely quick and friendly with her reply and gave us lots of information about the area and her wonderful home. You can really tell this is someone's home as it has everything you could wish for. We found it so comfortable and the pool was a god send as we had some days topping 38! You couldn't ask for a more private wonderful garden! And the views where amazing ! Chalais is a stones throw away and again wonderful and quaint but with everything you need even a Circus when we where visiting. Also so many close wonderful places to visit. I don't ever write reviews but felt I needed to as this place was brilliant! Thank you Sarah for you wonderful home and the goodies you left us to welcome us. Brilliant house, everything you needed was there. You could tell this was someone's home not just a holiday rental. Great location lots to do with a little one. Pool was a nice addition to cool off as we had amazing weather. Sarah was brilliant with communication from start to finish even checking we arrived safely. The welcome pack was greatly appreciated too. All in all a brilliant relaxing stay with all amenities close by. Thank you. Just beautiful. The house, the little hamlet and overall location. The house was very clean and well presented. Instantly felt at home and the welcome hamper was a lovely touch. From sitting out on the terrace listening to the crickets chirping with a glass of wine on an evening to the scent of wild mint that wafted while I hung out the washing just beautiful. The boys loved it there as much as we did. Sarah had left us lots of information on places to visit and the market days. Chalais market was really good. Aubeterre-sur-dronne was breathtaking. Lots of places to eat La Garage, Le Taverne, the tapas restaurant and cupcakes are definitely places we would recommend. The beaches are fantastic and very clean. We visited a few over the week. St Aulaye beach (about 15 mins away) was great and the boys (6&8 yrs old) loved the Parcoure (Go Ape as we would call it in the UK) they had there. Reasonably priced too!! Went to a go karting circuit which was around an hr away in Angouleme. That was quite expensive as go karting is but well worth a visit if it's your kind of thing as owned by a former indy car racing driver. So many beautiful places to see and visit a week just wasn't long enough. Would definitely recommend this property to anyone. The property is charming, has been well looked after, is in a lovely setting and has all of the modern comforts you could ask for. We were delighted to find this gem of a spot surrounded by beautiful countryside and a wealth of activities and places to visit. We only had a short stay but thoroughly enjoyed our time here and will certainly come again. Sarah, the owner of the property, was cheery, helpful and accommodating. Very quiet village in a nice region. We had a great holiday! The pool cooled down during the hot summerdays! Zeer rustig dorpje in een mooie omgeving. We hadden een super vakantie! Het zwembad bracht verkoeling tijdens de warme zomerdagen! Tres belle petite maison bien fonctionnelle au calme à la campagne, proche de la ville (Chalais) et de pas mal d'activités en charente ou en dordogne. Jardin agréable, piscine appréciable, tout pour plaire ! Hôte attentive, petit panier garni à l'arrivée, ... à recommander forcément ! Saint Avit is 45 minutes drive to Bergerac and Bordeaux airports. The TGV stops in Libourne and the local train station in 5 mins away. We are surrounded by some of the most fantastic wine regions in the world, Pomerol, Saint emilion, Bordeaux and Grave all offering vineyards and wine tours. River beaches can be found at Aubeterre and St Aulaye. Kayaks and canoes can be found at Riberac, Brantome and Aubeterre. The countryside boasts glorious Chateaux's, charismatic small towns. There are fishing lakes nearby and ideal walks for rambling. Angouleme is a 40 minute drive and you will find the Nautilus Water Park with 50m indoor pool, diving pools and outdoor, indoor slides and a wave machine. Angouleme also offers one of the best carting tracks around, run by a former Indy car-racing driver. For the small members of your group we can steer you in the right direction for, pony walks and play parks. For teens, there are mini golf courses and weekly open-air music concerts during summer. The local area offers Moto quad and Jet Ski rental, hiking expeditions, biking trails and horse riding. There are several golf courses within reasonable driving distance at Cognac (18 hole), Aubeterre and Angouleme (9 hole). The local town of Chalais, which is only 5 minutes away by car, has great shopping and amenities including banks, bars, boulangeries and restaurants. Every Monday morning there is a fantastic market selling local produces and wines.